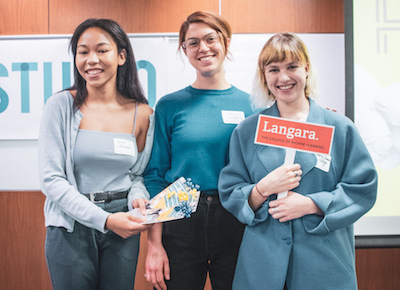 Vancouver, BC - Langara students in Environmental Studies, Nursing, and Marketing were awarded top prizes at CityStudio Vancouver's HUBBUB #11. The event, held at City Hall on November 30, showcased twenty-four experimental projects created by students together with City of Vancouver staff to address key city goals and challenges. Langara students took second place overall, as well as both People’s Choice awards. A panel of judges selected the top three projects and the audience voted for its favourite two. Second place went to Environmental Studies students’ “Blue Box” project to activate underutilized spaces to cultivate community and reduce the stigma around mental health. A first People’s Choice Award went to “Tell-a-Friend Initiative, Part 2 & 3”, courtesy of Langara Nursing and Marketing students. This project involved research for the Tell-a-Friend initiative connecting newcomers to settlement services and a marketing campaign to recruit volunteer community navigators. The initiative is in collaboration with the Vancouver Immigration Partnership. Langara’s second People’s Choice Award went to Environmental Studies students for “Seniors Safely Cycling”, which assessed Vancouver bike routes for a seniors’ assisted-cycling program. The project is in collaboration with the Victoria, BC chapter of Cycling Without Age. Two projects from the SFU Semester at CityStudio - “The Night is Young” and “Student Food Network” - took first and third place, respectively. All projects at HUBBUB #11 were created as part of CityStudio Vancouver, a unique collaboration that matches City of Vancouver staff with students from SFU, UBC, BCIT, Langara College and Emily Carr University to create and launch experimental projects on the ground. Mayor Kennedy Stewart attended the showcase portion of the event, exploring a number of projects and speaking with students; Doug Smith, the City of Vancouver’s Sustainability Director, shared a message with students about continuing to pursue change for the city despite challenges; and Chris Higgins of the City’s Sustainability Team emceed the event. HUBBUB takes place at City Hall every spring and fall organized by CityStudio. Over 250 students, City of Vancouver staff, faculty and community members attended this year’s event. CityStudio Vancouver is a non-profit innovation hub where City of Vancouver staff, students and community co-create experimental projects to make Vancouver more sustainable, liveable and joyful. CityStudio started in 2011 as a collaboration between the City of Vancouver and Simon Fraser University, and now includes six of the city’s public post-secondary institutions working together. In the last seven years over 4,800 students have worked on 500+ projects through CityStudio.